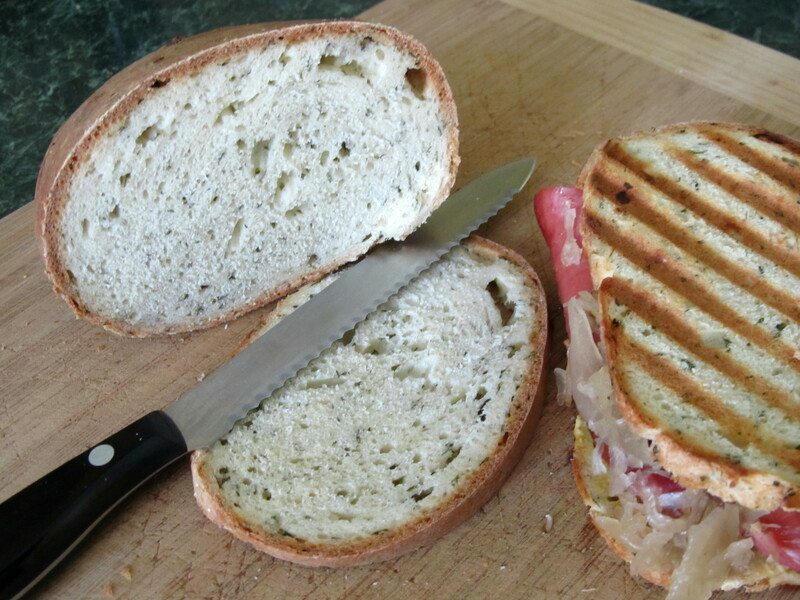 Makes a great knackwurst-sauerkraut Oktoberfest panini! Now is a great time for baking bread. This particular herb bread recipe from Carol Field’s The Italian Baker caught my eye because I’ve got a lot of parsley in my garden I need to use and I also thought the bread could be used in a variety of ways. After baking and tasting it, I think I’m right. You may look at the ingredients and think calling this an herb bread is a little misleading since there seems to be only one ‘herb’ incorporated into the dough; parsley. I kind of agree but is garlic considered an herb? It’s related to onion, leek, chives, and chives are an herb? But onions and leeks are considered vegetables. So what the heck is garlic? Vegetable or herb? Herb-table? I’m not sure, so I suppose if you count garlic as an herb it’s more of an herb bread than I initially thought which is fine since calling it a onion-garlic-parsley bread is quite the mouthful (of bread)! Onion definitely dominates the aroma and flavor but you do get subtle notes of the garlic and parsley. It’s a pretty straightforward bread recipe and I like that it doesn’t require a starter. One thing which’ll get you excited for the finished product is the aroma of the dough. As I made it I kept thinking to myself, if this bread tastes as good as it smells right now it’s going to be delicious. In addition to just eating it plain, I think this bread would be perfect for crostini or bruschetta, croutons for soup or salad, and it makes for great panini bread (the one in the picture up there…awesome). While the recipe in the book directs you to make two loaves from the dough I think one large loaf would be better, either as a round or as a long baguette, depending on what you want to use it for. In a mixing bowl combine the yeast and water, stir, and let sit for 10 minutes. Add the olive oil, parsley, garlic, and onion and mix. Mix the salt and four together. If using your stand-mixer slowly add 1 C of flour to the water/yeast/herb and mix until dough pulls away from the sides. Place the dough in an oiled bowl, cover with plastic wrap, and let rise for 90 minutes. Punch the dough down, divide into two equal halves (or not), and knead briefly. Shape into small rounds, place on parchment paper or cornmeal dusted board and allow dough to rise 45-60 minutes. Preheat the oven to 400°F. Place loaves in oven and bake for 40-45 minutes or until they sound hollow when thumped on the bottom. Remove from oven and cool on wire racks. No herb butter needed for these!